San Diego’s Meisha Barbee shares her new spring palette, the result of a whirlwind color mixing fling (check it out). 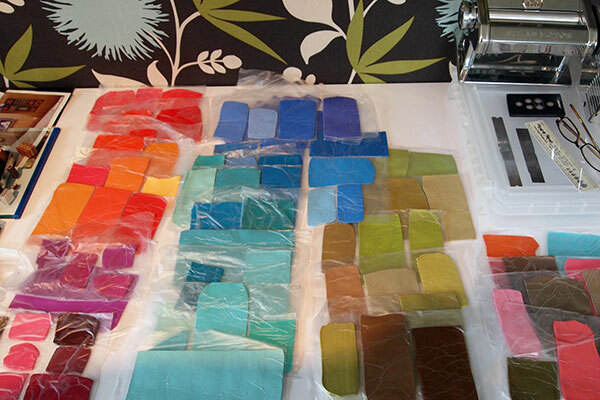 Once the polymer colors were mixed and conditioned, she carefully stacked the sheets into thick and thin layers that play off each other’s intensity. Her stripe canes grab attention. 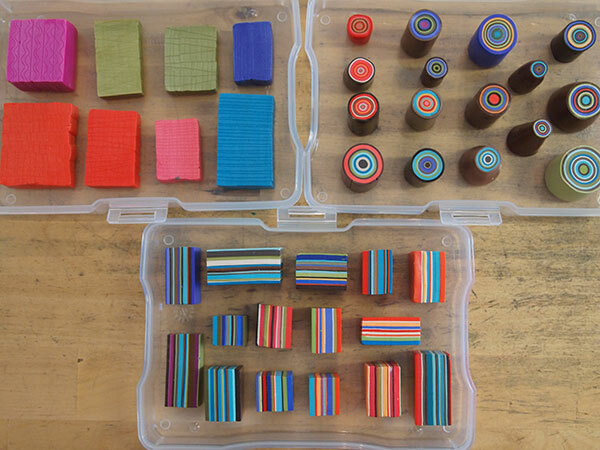 With a box of companion bullseye canes and another box of mica shift textures, she’s assembled the raw materials for a fresh line of brooches, pendants and earrings. Since Meisha works both in her home studio and at her Spanish Village Art studio, she needs to transport her canes from place to place. Doesn’t this tidy arrangement make you want to develop and organize your spring palette? See earlier pictures from this Niche Award winner here and here. I am ready for Spring and her color palette is enlightening! I’ve always admired Meisha’s innate ability with color and color combinations (among her other artistic talents) – these new ones are great. Oh, and to be that organized! 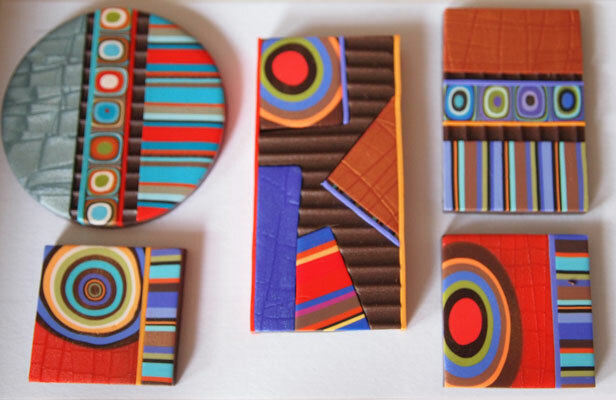 Maybe in some other life..
Meisha’s geometric designs are perfectly paired with her use of joyous, exuberant color. Simplicity at it’s sophisticated best…no wonder Meisha’s jewelry flies off the shelves. Kudo’s to her! Great color combos. They really pop! Love the extruded parts. Great pieces. I also loved seeing the Spanish Village Art Studio. What an amazing place that would be to visit. Cynthia I like how she organize the clay colors. I’m learning a lot with your Polymer clay daily. Thank you.